The International Choral Kathaumixw is held in Powell River every two years and welcomes more than 1200 singers, conductors and choir members from all over the world for a five day choral festival. It includesconcerts, common song singing, choral and vocal solo competitions, conductor’s seminars and social events. Kathaumixw is a celebration of people and cultures coming together to share the common language of song. Fittingly, it all happens right here in the middle of Powell River on the edge of the Salish Sea. Kathaumixw is world from the Coast Salish language that translates to “a gathering together of different peoples”. It is hard to imagine a more perfect phrase to describe the essence of this event. The festival celebrates the beauty and universality of song, and brings people together from far and wide to discover and share in a grand cultural exchange. PRISMA is an intensive two-week classical music program that is held every summer in Powell River. It aims to prepare musicians and young students for a career in music performance. Incredibly talented musicians come to town from all over the world to work with artists from the world’s most respected symphony orchestras. Students and orchestras perform a number of concerts in Powell River for the public as part of the event. The showpiece of the festival takes place on opening night: an open-aired “Celebration of the Senses” at Willingdon Beach. Every year this event is attended by an excited Powell River audience. The academy is usually held in June each year. Powell River Logger Sports is an annual competition held in July each summer at Willingdon Beach that showcases the incredible strength and feats of members of the forestry community and celebrates the rich history of forestry in the Powell River region. Events include chopping, tree climbing, axe throwing and relays as contestants from all over the world compete for Canadian and World Championships. Logger sports is a highlight in the Powell River festival scene, drawing thousands of spectators each year over the three days of competition and events. Sunshine Music Festival occurs every Labour Day weekend at Palm Beach, 15 kilometres south of Powell River. The festival focuses on Canadian musical talent, offering friendly atmosphere for the whole family. The beach-front setting is full of artesian markets, food vendors, a kids zone, and more. The festival has been running for over 30 years and promotes up and coming local and Canadian talent with other musicians from around the world. The family friendly setting and environment has been a cornerstone of the Powell River music scene now for three decades. The Blackberry Festival is a week long celebration of those delectable berries that grow so abundantly in Powell River. Every day of the festival holds distinct events, including live music, Arts Alive in the Park at Willingdon Beach, and the Festival of Lights firework display. It culminates with everyone’s favourite part of the festival, the Street Party! The Open Air Market holds a Blackberry Baking Contest and special Blackberry games for kids. Local businesses, bakeries, and breweries make Blackberry specialty drinks and desserts in celebration. The party attracts thousands of people to Marine Avenue for music, dance, games and blackberry related food of all kinds. The festive, family friendly atmosphere is synonymous with the Powell River community. Sea Fair is one of the oldest fairs of it’s kind in Canada, with over 40 years of operation! 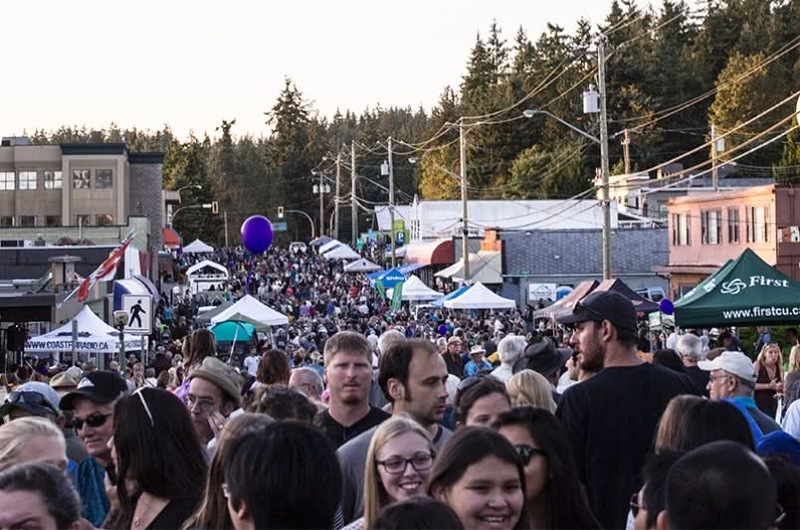 Seafair is a three day festival of rides, entertainment, vendors, fireworks, parades and competitions focusing on the Willingdon Beach area of Westview in Powell River, including bathtub races, amusement rides, many vendors booths from local businesses, and much more! Sometimes the best way to experience a location and get a feel for a place when you are on vacation is to rub shoulders with locals in their day to day lives. Powell River has a huge range and varieties of local farmers, artists, musicians and artisans that get together every weekend in the summer at Paradise Valley Exhibition Park and hold an old-fashioned, country style farmers market with scores of local vendors selling produce, plants, baked goods, soap, honey, woodcrafts, jewelry and other handcrafted goods. This all culminates in mid-September when the fall harvest is celebrated in an epic Fall Fair. The Farmer’s Market is transformed from a busy market to a bustling fair with animal and produce contests, music, games and rides, great food, and a huge increase in the number of vendors selling everything from produce to a wide range of homemade and artesian goods. The Powell River Farmer’s market is held every Saturday during the summer months at the Paradise Valley Exhibition Park. As well as fresh produce, a wide variety of local artists and artisans have booths selling everything from jewelry and t-shirts to handmade yew bows and medicinal plants in a rustic, outdoor, country market setting. Local artist Debra Bevaart uses strong coastal imagery to create incredible stone carvings inspired by local wildlife and landscapes. She also represents over 40 other local artists in her gallery, located in the Lund Hotel at the end of Highway 101. 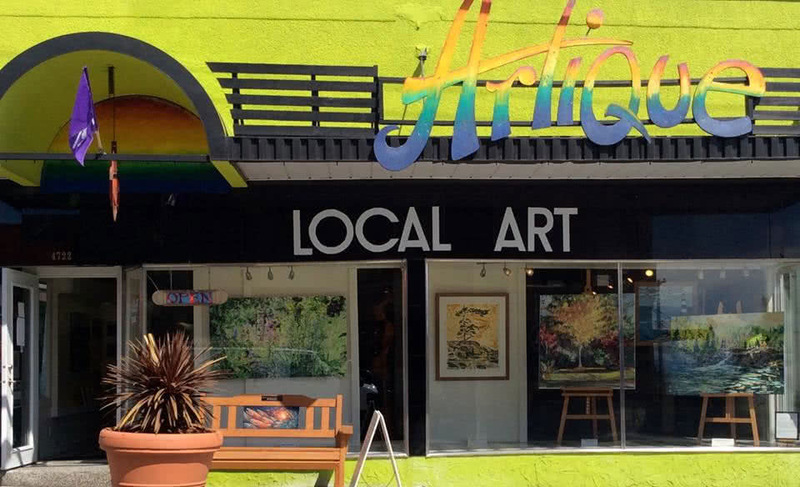 Artique is a collective gallery on Marine Drive that showcases the work of over 30 different local artists and artisans. Artwork includes watercolours, oils and acrylics, textiles, stained glass, leather work, sculpture and more. Artique is a fantastic community gallery and probably the widest selection of local art and artists in Powell River! The Powell River Edible Garden Tour showcases a number of edible gardens from Saltery Bay to Lund. The tour is a great way to see how people in the Powell River region are producing their own food, and to learn about all kinds of food growing in a backyard setting. The Edible Garden Tour takes place in August each year. The Townsite Heritage Society was formed in 1992 to protect, enhance, maintain and promote the historical character and integrity of the traditional neighbourhood and business section of the Powell River Townsite. Located in the historic ‘Dr. Henderson’s House’ in the Townsite, the society hosts a resource and interpretive centre, as well as facilitating walking tours through the Townsite neighbourhood itself. 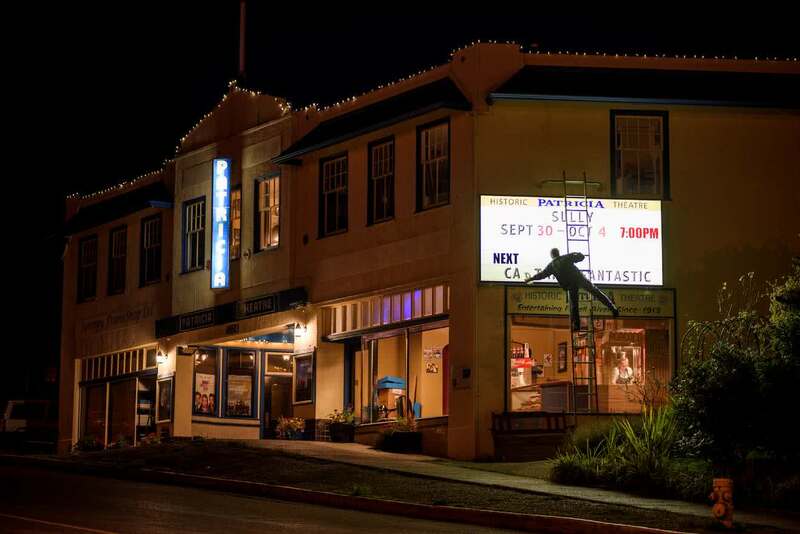 First built in 1913 – just 3 years after Powell River was settled around its pulp and paper mill – the Patricia Theatre is considered the oldest operating theatre in British Columbia. Throughout the town’s history, the Patricia has, to some extent, been its heartbeat – a place for people over the years to meet, mingle, and catch up on news and entertainment from all over the world. Today the Patricia Theatre plays Hollywood blockbusters as well as arthouse and classic films to a new generation of local audiences.